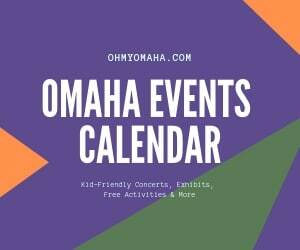 If you’ve been reading this blog for a few months, you know I like exposing my kids to performing arts experiences around Omaha. 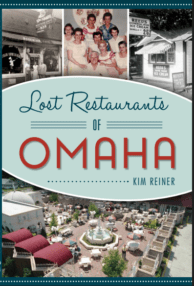 Our latest arts adventure has been at the Henry Fonda Theatre Academy at Omaha Community Playhouse. 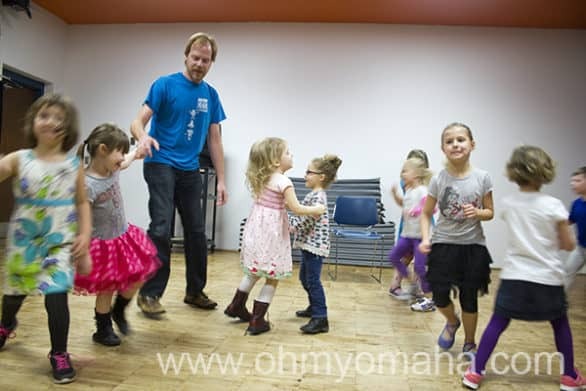 Omaha Community Playhouse is home to the Henry Fonda Theatre Academy, which offers classes for a range of ages. The education department at the theater invited my kids to attend the classes complimentary so that I can tell you about them. Since my kids fall into different age groups, I’ll write separate posts about each. Let’s start with Creative Drama, the adorably fun intro to theater for children ages 4 to 6. Later this week, I’ll tell you about Junior Players, for children ages 7-10. 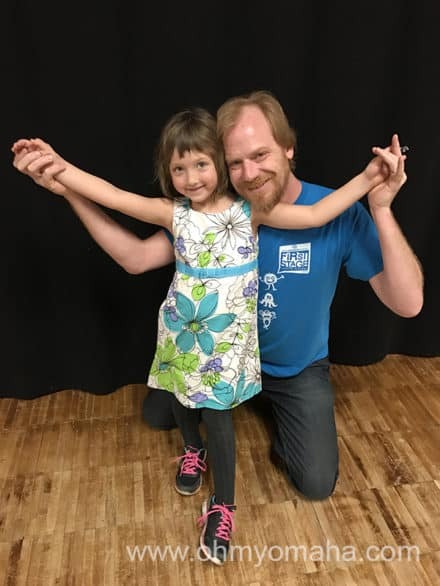 My daughter and the teacher of Creative Drama, Matthew, a seasoned actor you’ve likely seen on different stages around Omaha. What my daughter thought the class was: An hour-long silly session with Mr. Matthew. What the class really was: Children play games that teach them how to use their bodies and voices to share emotions. In one session, they played “I’m a little teapot” using angry, sad, and happy voices and posture. They do a lot of games that involve following directions on cue and learning ways to use their voices without damaging vocal chords. In a later class, children played a game where they tried to guess the emotion of a volunteer based on their body language. All helpful stuff for my daughter! This may have been the scene during the Creative Drama “share” day when the children were to act like knights. They look like they’re galloping, right? Parents aren’t allowed to sit in on these classes. If you’re a manic photo taker like myself, it’s a tough pill to swallow. However, this allows the children some independence and removes the parental distraction out of the equation. Mooch wasn’t very forthcoming with what she did each week in class. She seemed to leave class each week with a smile on her face, so I’ll take it as a good sign. You do get to see some of what they’ve worked on, though. At the end of the six-week session, parents are invited to sit in on a “share” day, which was the final 15 minutes of the last class. During my daughter’s “share,” we saw her do an improvised puppet show with a classmate, as well as some pretend scenarios. We also got to see the teacher interact with the students, and Matthew was fantastic, patiently trying to herd the kittens coach the children and encourage the more stage-shy children to participate. The dramatic tale about a princess, a queen elephant and some missing pencils, presented in a Creative Drama class at the Henry Fonda Theatre Academy. The next session of Creative Drama begins the week of April 3 and registration is already open. 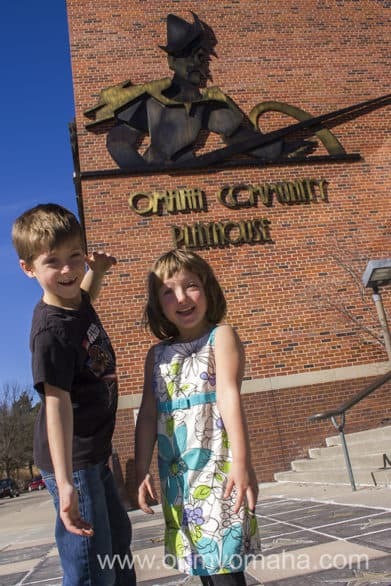 You can register your little one for the spring session here (and if you’re a plan-ahead kind of person, you can register for the summer there, as well).